The new, simpler, Skype messaging app. 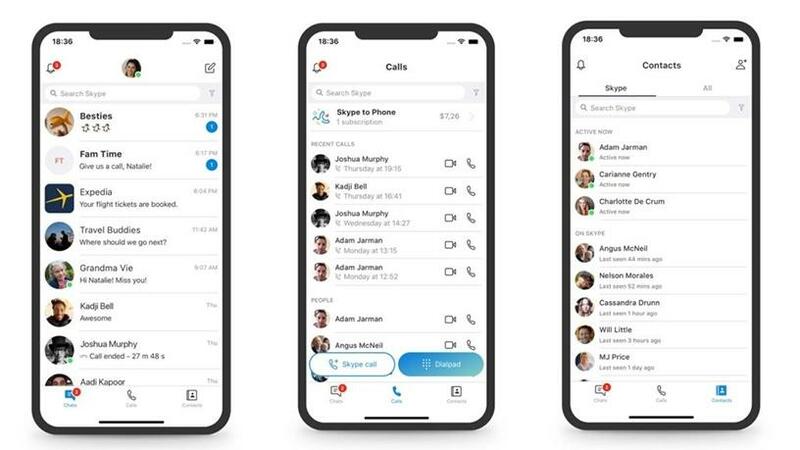 Microsoft-owned telecommunications application software product, Skype, has listened to complaints that features added in the last year have overcomplicated the product, and has decided to strip back and simplify. Last year, Skype announced it would add a feature called 'Highlights', which allowed users to post a picture or video for their followers to see, before it disappeared after a certain amount of time. The ephemeral feature was first made popular by Snapchat, and then copied with great success by Instagram and other Facebook-owned products Facebook Messenger and WhatsApp. Peter Skillman, director of design for Skype and Outlook, says Skype has grown from a voice-only calling site, to adding video calling, messaging, group video calling, and a broad range of other features and services. "As Skype functionality has expanded, so too has its complexity. As with any feature-rich product, maintaining simplicity while enhancing functionality is critical to usability. "This past year, we explored some design changes and heard from customers that we over-complicated some of our core scenarios. Calling became harder to execute and Highlights didn't resonate with a majority of users. We needed to take a step back and simplify." Users will have until the end of this month to download their Highlights before they disappear forever. Skillman says the company has simplified navigation with the app to refocus on why users use Skype: to make a call or send a message. "Our new navigation model removes redundant and underused features that create clutter, making it much easier to find the people you want to talk to and contact them in an instant." The mobile app will now have only three buttons at the bottom: Chats, Calls and Contacts. Highlights and Capture will be removed. On the desktop app, the Chats, Calls, Contacts and Notifications buttons will be to the top left of the window. The team is also over-hauling the design to make the product easier to use at night with a darker theme, as well as toning down the visual range of the gradients for the classic day themes. "To develop these designs, our team worked closely with Skype customers. We looked at how people use Skype apps, performing extensive testing across global markets and building prototypes to test new concepts," says Skillman. He notes there is also a space where users can vote on new features they want the team to prioritise. "This is only the beginning and you can expect many more updates over the next several months as we continue to simplify and improve the core experiences around calling, chat and contacts." Microsoft signed a deal to buy Skype for $8.5 billion in May 2011.